Rometta lays near the confluence of two rivers the Rosaro and the Aulella whose torrents have carved deep gorges into the underlying rock below. Steeply wood hillsides rise from the narrow valley floor dominated by the river, around which the road and railway thread themselves along the precipitous banks and across bridges as they pass the village from Aulla to Fivizzano. The village is a truly authentic base to stay with every aspect of Italian culture evident from the collection of fire wood and little tractors to manufacture of wooden wheels and shutters at the local carpentry workshop. It is a working village served by local shops and bars that will meet your everyday needs and a number of Pizzerias and restaurant are within easy distance. The main village is located atop a rocky outcrop, parts of which date back at least 600 years and is located on the north side of the Aulla – Fivizzano road. The village is served by train and bus. Our property is located near the modern church and away from the historic centre all be it that parts of our property are at least 400 years old. It adjoins the original road through the village which has long since been bypassed, due a very low property built over the road. 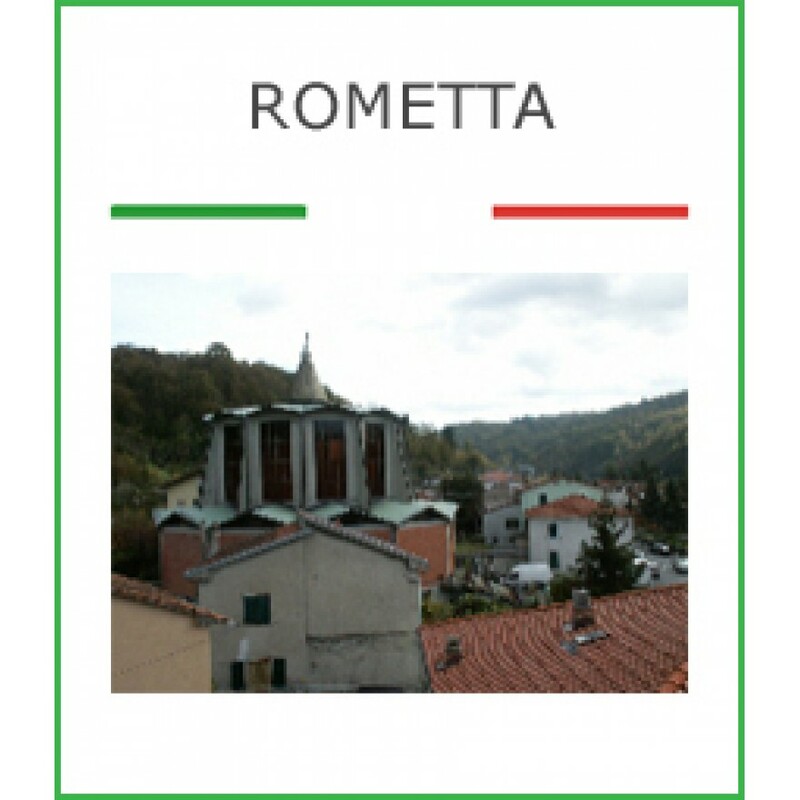 Rometta was recently designated the centre for five national parks and a beautiful marble piazza was constructed along with a new information centre adjoining Rometta station. Weekly markets are held on the marble stalls selling all manner of produce from the national parks. The Accommodation is within an historic house, accessed through an equally historic former manor house. Casa Canoa Sopra, the main house, which sleeps 4, is arranged over two floors, has two bedrooms, a double and a twin, a full bathroom and a large kitchen/dining room. A bright and airy double aspect sitting room on the top floor has views to the wooded hills and the village of Ceserano. Below with a separate access, also through the manor house is a spacious self-contained studio, sleeping 2 on a fully sprung sofa bed in a living area with kitchenette and separate shower room. The whole refurbished property is centrally heated. We can offer accommodation for parties from two to six people, in this traditional village home. The nature of the property does preclude its use by the infirm and they are not really suitable for very young children. We do not take pets. Subject to availability the studio can be combined with the main house at the standard rates. Sufficient additional crockery and seating is provided in the main house so that the studio can serve purely as additional bedroom accommodation. The house and studio are available all year round at appropriate rents. Both properties have gas hob, electric oven, gas fired hot water and central heating: (heating supplement payable in winter). Pillows, duvets and/or blankets are provided and a weekly linen service to include bedding, towels and tea-cloths. Please bring your own beach towels! For our three bedroom home, alternative two bedroom house and further studio, giving additional accommodation up to eight/ten see our properties in Gassano.